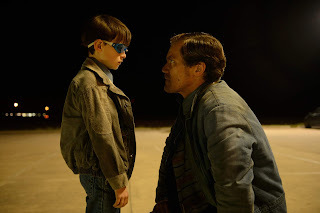 A science fiction chase thriller, Midnight Special has a few ideas mainly derived from other movies, and generally wastes them. In rural Texas, eight year old Alton Meyer (Jaeden Lieberher) is kidnapped by his father Roy (Michael Shannon) and accomplice Lucas (Joel Edgerton). Alton was being raised by a religious cult under the leadership of Calvin Meyer (Sam Shepard). The cult worshipped Alton as he appeared to possess superhuman special powers, including emitting light beams from his eyes and sharing visions and knowledge of supernatural events. Alton mainly functions at night, his eyes covered by shades whenever he is near bright light. The FBI raids Meyer's ranch, worried that the cult members were stockpiling weapons in readiness for a day of reckoning foretold by Alton. Paul Sevier (Adam Driver) of the National Security Agency participates in the interrogations, and deciphers some of Alton's coded messages, identifying a likely location where he may be headed. 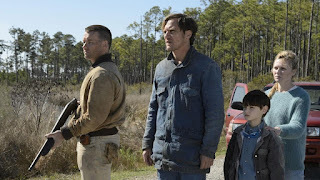 Meanwhile, Roy and Lucas connect with Alton's mother Sarah (Kirsten Dunst), as they make their way with the boy to a mysterious rendezvous location pursued by the cult members and the government. Written and directed by Jeff Nichols, Midnight Special borrows heavily from two Spielberg science fiction classics. Alton is a stranded alien with special powers trying to find his way home, evoking E.T., while the search for a secret location that could be a rendezvous with a superior interplanetary species comes from Close Encounter Of The Third Kind. It's also not a stretch to find echoes of Spielberg's Sugarland Express here as well. The ideas are borrowed, but the quality of execution and narrative momentum is not. Nichols botches his pacing by playing hide and seek with his plot, the essentials of the story barely progressing from the opening scene to the final 5 minutes. Alton is abducted in the opening credit sequence; Nichols drops obtuse hints about his story for the next 100 minutes, which consist of one long drive and not much else of consequence. Then Midnight Special wraps up with some glistening CGI-created effects set to wondrous music. Along the way Roy and Lucas prove to be rough-and-tumble kidnappers with relatively good intentions, while Sarah does not quite seem to know what her role is supposed to be. The government types scurry around one step behind the action and botch every opportunity they have to grab a hold of the situation. The religious cult sub-story fades in, then out, then in, before being unceremoniously dropped in its entirety. The rather tired premise that anyone or anything a bit special attracts ideas of worship or weaponization rumbles in the background. Most of what makes it onto the screen is a distraction, the journey to an empty field existing in a core narrative void. Midnight Special pretends to have a story to tell, but it delivers tepid leftovers devoid of substance.